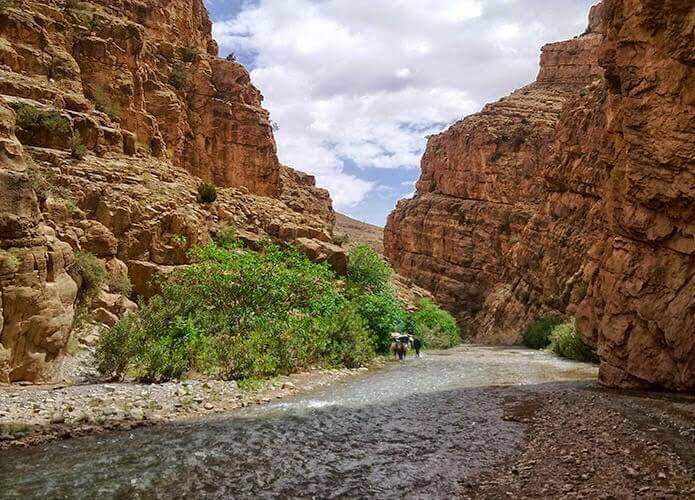 Mgoun Traverse: 6-day hiking through Mgoun gorges, and the wildest valleys of Morocco. Mgoun Traverse is an option to enjoy stunning views of spectacular Mgoun Canyon which is available just in summer. 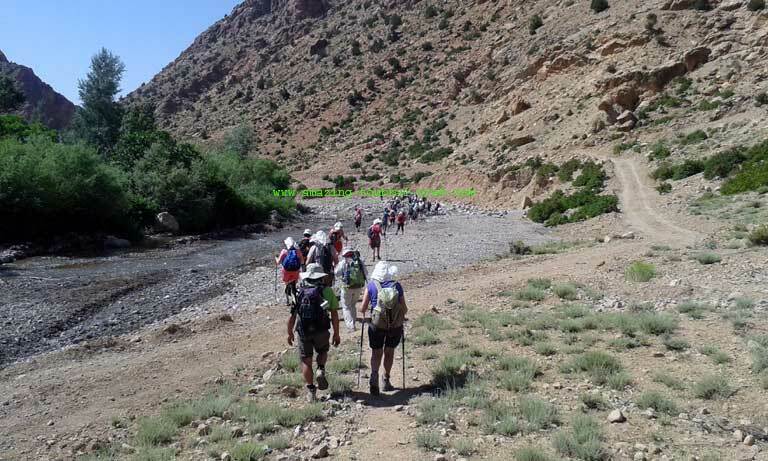 The trek starts from the beautiful Ait Bougmez to the high Atlas Mountains. We then trek through the deep gorges that lead to the renowned roses valley. The Valley of Roses will give us a chance to experience untouched nature, in all its beauty. Other exciting views include the old fortresses of Kasbahs and the Berber villages perched on the sides of the mountains. – Meet local Berbers, discover the daily life and true Moroccan hospitality. After an early breakfast, we set off to the valley of Ait Bougmez, which is a five hours journey. There will be a picnic in Azilal. At the Valley, we meet our mule team then we spend the night in local Guesthouse at Timit village. 5 hours drive. In the morning, we leave the valley and walk on a winding trail up to the pass, which has spectacular views of the Mgoun Massif and Happy Valley. We then take a long descent in the afternoon on a single trail to Ouzighimt Valley. Overnight camping in the tents. Very close to Tighremet n’Ait Ahmed old granary, which was previously used for desert caravans. 6 hours trek. We trek down along the Ouzighimt valley and pass through several Berber villages of El Morabitine, Wawchki, and Ighrem Izderne. We will meet the inhabitants of the valley, with the unique costumes and hairstyles of the Berber women. Overnight in tents. 6 hours of trekking. We leave very early in the morning, after breakfast for the narrow Mgoun gorges. We walk in water through towering narrow canyons. There is an alternative route to take, if the water is too much, we could take the Tizi n’ Ait Hamed pass. Lunch spot will be made at the exit of the Gorges. Overnight camping in tents near Aguerzaka. The estimated duration of the trek is 6 hours. After breakfast, we continue our trek in the river, walking in water to the BouTrar Village. Overnight in local Gite. 5 hours trek. Early in the morning, we head back to Marrakech. You spend the night in the hotel. 6-hour drive. – Mgoun traverse is available and can be arranged for groups of all sizes. 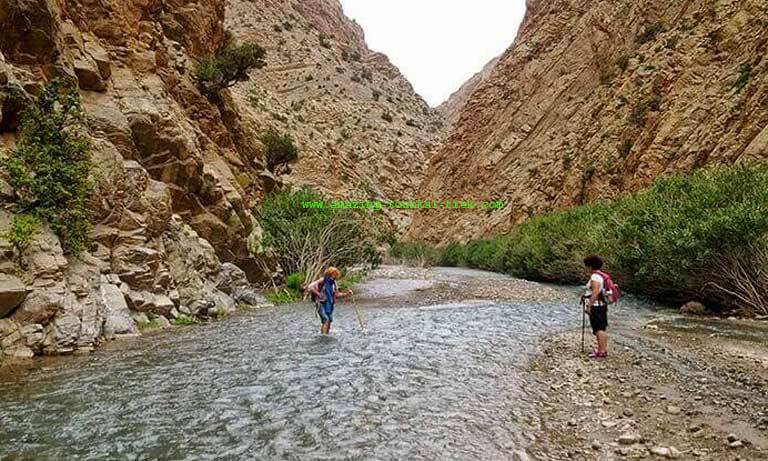 During Mgoun Traverse you will explore Ait Bougumez valley and the canyon of Mgoun valley. 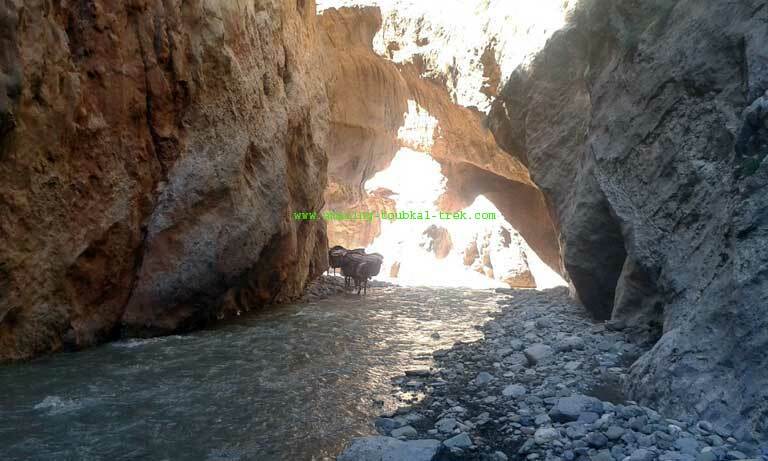 Trekking through Mgoun Gorges, Mgoun Traverse Trek.